Given the abbreviated size of the board, this In-Store Giant Checkers Try-Me Display would make for very short games. But it does demo an oversize Checkers set for sale in the Games Department. In addition to being a merchandising presentation, it might provide a playful distraction for kids shopping along with adults, or even the adults themselves. 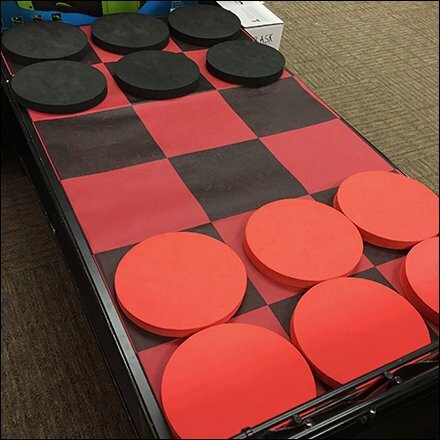 Look close at this In-Store Giant Checkers Try-Me Display to see that the Board is fabric and folded under to minimize playing surface here.